My book was self-inspired by my experiences as I struggled in my personal journey with God. 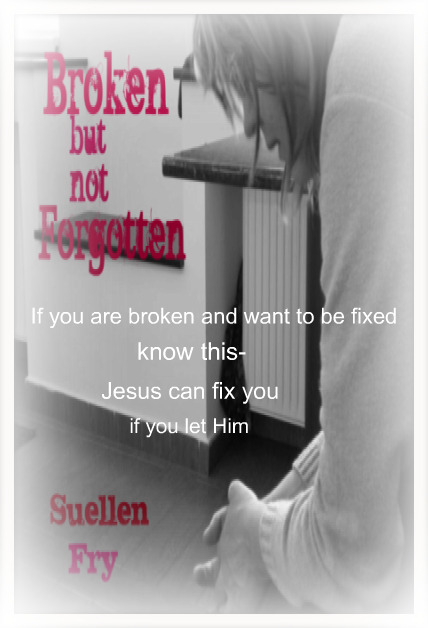 After a broken marriage and living in a back-slidden state, I felt broken and beyond repair. But the Lord had different plans for me. He began to heal my broken spirit-one day at a time. So she drove...until she saw the pretty lights that adorned the quaint white house on the corner of 1st and 33rd. The flashing sign spoke to her. "Hiring"it said, as the flashing neon light caught her attention. "Wow, I need to check this out." So she parked her car by the front entrance, hoping she would land this job. Straightening her blond haired pony tails and gliding her fuchsia shaded lip color on to her mouth, she clumsily climbed the small steps that guided her towards the front door. A neatly printed sign sported the door. RING BELL . A quick buzzing sound caught the attention of a pretty, petite red head that gracefully answered the door. Little did she know that once she walked through that door-her life would change-in an instant. She was about to sell herself in more ways than one. As she wiped away her last tear she quickly apologized to God. “I have no choice, I have to feed my boy and I have bills to pay", she replied as she continued in her apologetic manner. But ...she did have a choice. Fear had surrounded every thought. The enemy’s voice grew louder and more assuring. “You are so far behind in your bills, and the money is good, this IS your only way out.” So...she took it. She took what she thought, was the only way out. The money rolled in. And he was right. The money was good. One sin led to another and before long she was doing what she thought she’d never do. It was almost more than she could bear. So she had to get high to numb the pain. It was easier that way. Then one day she tried a drug she swore she’d never try. As her 4 year old son lie home in bed with a hired sitter...she lie in a bed in a nearby motel room unable to feel the pain of the past few months. But then -something happened in that room. What she witnessed could only be a miracle, for The Lord was right there in the midst of a room full of drug addicted souls. As she sat up after her last intake of illegal drugs the Holy Spirit began to speak. Soon a conversation about Jesus permeated the smoke filled room. To her surprise-there were many back slidden Christians– in that room. One of which was her own drug infested self. And...to her surprise, the Lord chose to speak, regardless of who was there or the situation. It was the dawn of a new day. She picked herself up, brushed herself off, and walked in the house. There was only one way out. She had a choice. She took it. She chose Jesus Christ.